We have been working hard to keep up with all the social media sites and review sites that there are. Below are tabs and links to the sites that we have been working with and are currently on. Keep checking the page because the more we expand the more sites will be added. Take advantage for the special offers and discounts we have set up for each site. To make an appointment simply give us a call or click on the "Services" tab and send in your services request form or send in your own review. And we'll be sure to add it to Facebook or to our "Testimonials" page. We want to here what you have to say about our services. Good or bad we want to know how we can improve our business. Follow the links below to send in reviews, to rate us, or to let Facebook users know your experience. 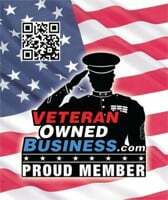 Veteran Owned Business Member - we are proud members of the Veteran Owned Business Project. VOB is the leading FREE directory of nearly 20,000 businesses owned by military veterans (VOB), active duty military, reservists and service disabled veteran owned businesses (SDVOSB) of the United States Army, Air Force (USAF), Marines (USMC), Navy (USN), Coast Guard (USC) and National Guard. Join us in showing your support for our armed forces by proudly searching for products and services that are all made by, sold by or serviced by United States military veterans!